The advent of the new era in human social evolution has once again resulted in an increased focus on body aesthetics. Just like the ancient Greeks, we adore physical beauty, whether knowingly or subconsciously. Muscle augmentation is a viable alternative to spending hours and hours on weight lifting and aerobics, not only for those who crave perfection, but also for those who wish to attain simple balance or symmetry in their physique. For many people no amount of working out will secure the results they desire and deserve. When taking a patient who seeks to augment his or her musculature, Dr. Chugay will carefully balance the wish for body aesthetics with medical necessity. Should you wish to become a candidate for these procedures, Dr. Chugay will evaluate your mental and emotional state, and you and the doctor will make the ultimate decision whether muscle augmentation is right for you. Dr. Chugay has personally created special procedures, designed unique implants and perfected other methodologies for augmenting various areas of the body to give you the physique that you’ve always dreamed of. Which Muscles Can Be Augmented? The buttock muscles (for men and women), chest muscles (for men), biceps, triceps, deltoid, and calves. It is possible to augment other muscle groups. 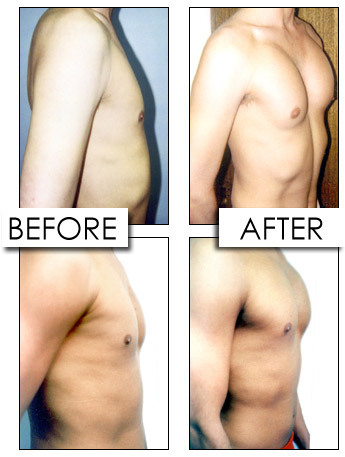 You will need to schedule an appointment to see Dr. Chugay if you have an interest in augmenting other muscle groups. He will explain to you if it is medically sound and feasible.